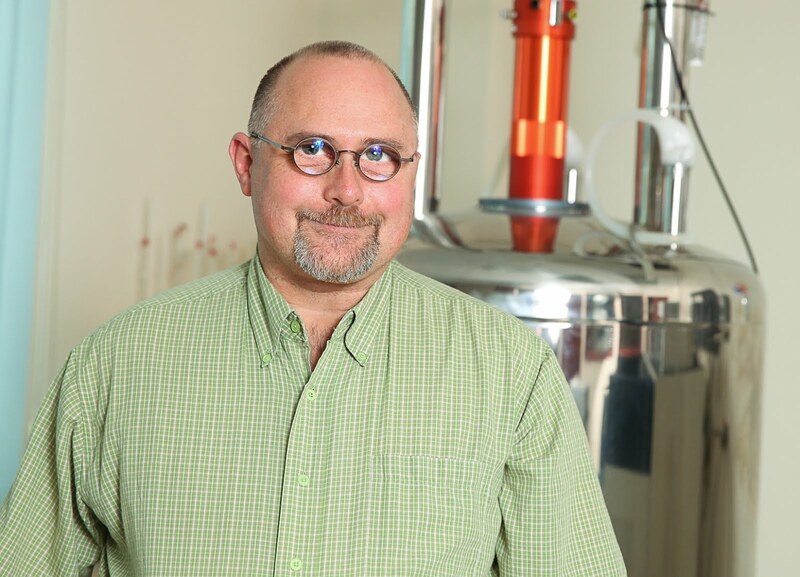 University of Ottawa NMR Facility Blog: Better 2D Data - More Scans or More Slices? 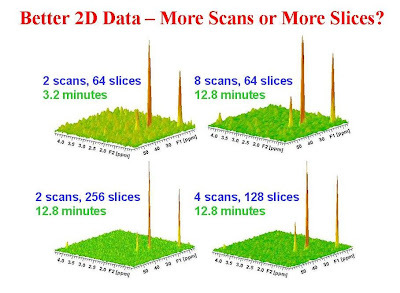 Better 2D Data - More Scans or More Slices? The question frequently arises: is it better to take more scans per increment of more increments in order to get higher quality 2D NMR data? In a 1D NMR spectrum acquired with sufficient relaxation, the signal-to-noise ratio increases with the square root of the number of scans taken. We can expect the same to be true of a 2D spectrum as well, therefore in order to double the signal-to-noise ratio one must collect 4 times as many scans per increment resulting in a four-fold increase in experiment time. Providing that there is more signal to be attained at longer evolution times, increasing the number of slices in a 2D data set increases the resolution in the F1 domain in a completely analogous way to increasing the acquisition time in a 1D data set. The higher F1 resolution implies narrower resonances and if the signal-to-noise ratio is measured based on peak height, then the overall signal-to-noise ratio is improved (as the area of the resonance must be constant). Also, the amount of overall signal in the 2D matrix is increased with the number of slices collected and therefore the overall signal-to-noise ratio is increased even more. Of course, if there is no more signal to be obtained at longer evolution times, then collecting more slices will only increase the amount of noise. HMQC data for 2-bromobutane is presented in the figure below showing the effects of increasing the number of scans vs the number if slices in such a way as to increase the experiment time by a factor of four. All of the data were scaled to have the largest signal at constant height. In this particular example where more signal was available at longer evolution times, the most improvement in the data is achieved by increasing the number of increments by a factor of four. It is worth noting that forward linear prediction in the F1 domain can also be used to increase the amount of signal and resolution while still maintaining short experiment times. Sorry Glenn, it is possible that there was a mistake in the text and do you mean that the number of scans improve F1 and not the number of slices? The signal-to-noise-ratio in the 2D data increases as the square root of the number of scans just as it does for 1D data. Providing there is more signal to be obtained at longer evolution times by taking more slices, one improves the signal-to-noise ratio of the 2D data by taking more slices as well. This is because with more slices, the linewidths of the peaks in F1 become narrower therefore the overall height of the 2D signals increases relative to the noise. If there is no more signal to be obtained at longer evolution times by taking more slices, one would not expect an improvement in signal-to-noise ratio. I am a little bit confused: Why should I ever increase the number of scans per increment then? If by increasing slices I gain the same amount of SNR and at the same time increase the resolution, then it is never worth increasing the number of scans. (with the exception of very diluted samples.) Why are people then measuring 2Ds with increased number of scans? One can indeed improve the SNR in a 2D spectrum by increasing the number of increments however, the signal falls off at longer evolution times (later increments) so there is a practical limit to the number of increments one should collect. See also the comment above made in response to Ricardo on January 14, 2013. 23Na Background in NMR Tubes. How High Should the 2H Lock Signal Be? The 13C and 13C DEPT Spectrum of "Acetone-d6"
New Solids NMR Equipment for Ottawa U.